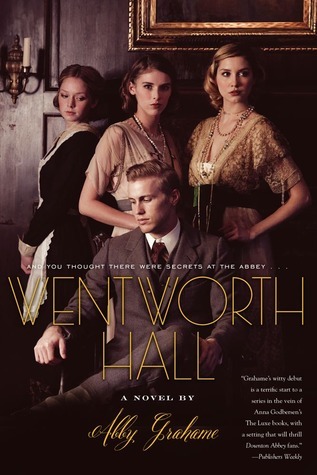 Blurb: A must-read for Downton Abbey fans—a lush, historical novel about the secretive Darlingtons of Wentworth Hall.Can’t get enough of Downton Abbey? Visit Wentworth Hall. It’s one of England’s oldest estates, and the Darlingtons are among the elite class of British society. But under the wealth are secrets that must stay hidden. It’s 1912, and eighteen-year-old Maggie and her mother have just returned from a year abroad where Lady Darlington has had a baby boy, James. But he is not the only addition to the house. They have also brought back Therese, their new French tutor, as well as welcomed the orphaned teenage twins, Teddy and Jessica, who have just lost their father aboard the Titanic. This adds to an already crowded house of Darlingtons and staff, all of whom have a penchant for gossiping about their employers. As time passes, it becomes clear that Teddy and Jessica would rather be anywhere else and that Maggie is a different person from the one who left Wentworth. Her family’s financial future rests with her finding the best husband—and her parents are sure that is Teddy. When scandalous satires start appearing in the newspaper with details that closely mirror the lives of the Darlingtons, the family is determined to find the culprit and keep their affairs under wraps. But at Wentworth Hall, nothing stays secret for long…. Review: I have a sort of rule with myself that I will not take reviews from Goodreads to mind before and during a book because some of my absolute favourite books have received books terrible reviews that they completely do not deserve (see Atonement, Shatter Me etc.) Therefore before reading this book, I tried to keep an open mind despite the low average rating of 2.83 and pages upon pages of reviews with one star saying that they ‘could barely finish’ the book and whatnot. I soon learnt, much like many of the other reviewers, that this was not a book to judge of the beauty of the cover (I’m a sucker for covers with girls in proper dress for the era) or the comparison to Downton Abbey in the blurb. I was expecting a book filled with mystery and romance with the obvious historical element to it, and of course, I was hoping for a little bit of a Downton Abbey feel to it. Immediately, I was hoping that Maggie would become a sort of Lady Mary-like character- a cold exterior at the beginning that would eventually make way for a good heart. For a few chapters, I held onto this hope but it was soon forgotten- Maggie became a sort of secondary character who was only really bought up when she was needed, I felt like she didn’t get the chance to really develop as a character at all. Furthermore, I feel like there wasn’t really any character that got the chance to develop, sure we learnt about their dreams and their pasts and whatnot but they never really grew into anything. I don’t think there is a single character that I could genuinely say that I liked or even felt sorry for at all, except maybe the baby because the poor thing would have to grow up in that. The ‘secrets’ of the Darlingtons and the other characters weren’t really secrets, if you paid enough attention to things then you could easily see them coming. I had been expecting some real mystery surrounding the secrets but there wasn’t any- I felt quite let down by this. I think probably one of the only things I enjoyed were the satires that were included. They were meant to be absolutely ridiculous but they were actually much more enjoyable than most of the book, which is a shame really as I had been so excited to read this book before it was released. Though I didn’t overwhelming enjoy this book, it was a very quick read which was nice and it didn’t really require much of my attention, other than an eye roll now and again.